Very well equipped town house with 160 sqm well suited for 6 persons. Mediteranee just 5 kilometer by car with access to a very nice beach. Available for long term rental if interested. Just request a price. The house has 3 levels. At the bottom level 2 bedrooms and one toilet with shower. Each bedroom equipped with a double bed. It is possible to rent linen/towels (13€ pr. pers). From this level a staircase leading to a big and spacey living room well equipped with furniture. Also a big fireplace to be used out of season. At this level also a big bedroom ( with a double bed ) and access to toilet/bath. At the top level the kitchen which is just renovated ( may 2011 ) and a completely new kitchen installed. At this level also the outdoor roof terrace. The roof terrace is in 2 levels with 25 sqm at the bottom partly covered and another 10 sqm above that,from where you have a beautiful view towards the Cevennes. The covered part is very nice on hot days. Nearby cities: Lot of vineyards in the surrounding area, with nearby cities like Agde(7km),Sété(20km), Béziers ( 30Km) and Montpellier(40km). Local market twice a week in Marseillan. Tuesday morning the traditionally market and Friday evening 'Marché artinasale' with all kinds of stuff - painting, clothing, hand-crafts. And don't miss the big market in Agdé every Thursday . This is really a visit worth but attend early. And don't forget to visit Montpellier. When going by car just park by IKEA and take the TRAM to the centre. Getting in/out of Montpellier isn't fun for the driver. The TRAM cost 2.50 € for a return ticket. Nearby activities: Fancy River rafting / canoeing? This is just one hours drive away towards the Cevennes. Walking trips also in the Cevennes. Lot of possibilities to play Golf in the area. One of the best beaches in France only 10 m. by car away. Wine / Food: If you like seafood you will be in one of the best spots in France. Lot of possibilities to taste or bye seafood in the surroundings. You don't need to leave Marseillan to taste good food. Lots of restaurants in walking distance. And wine. Just nearby on the road to Mezé we have bought most of our wine during the last 10 years at 'Morin Langarin'. Don't miss this. Very good wine to a reasonably price. And the 'la Clape' area between Narbonne and the sea. Here you will find very good wine yards. Ask for more information on this. Shopping. Carrefour in Marseillan has all you need. If you prefer a bigger shop use the Hyper U in Agdé. We bought this house in 2001 and have since then completely renovated the house but still with respect for the old materials and trying to keep the atmosphere of an the old house. We are a danish couple living in Svendborg on the island funen. One of the bathrooms has just been renovated ( spring 2012 ). Unlimited wireless internet access installed spring 2012. Due to changes in the signals a new TV will be installed summer 2012. 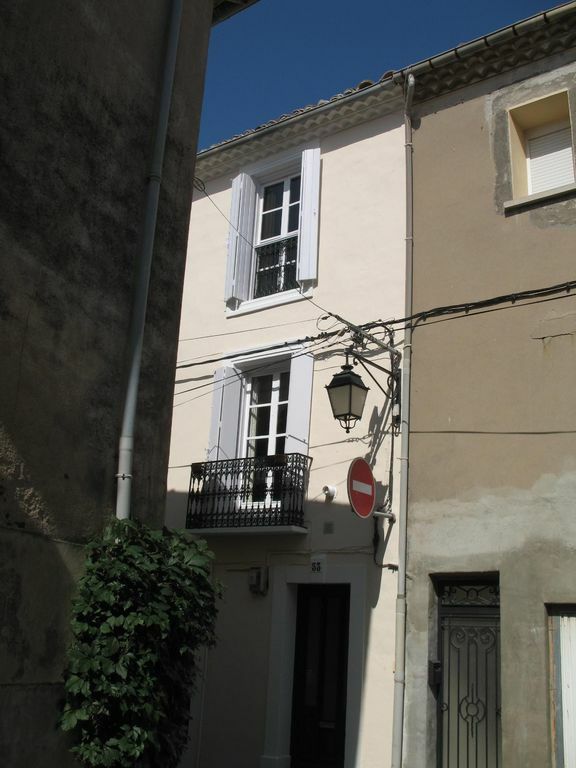 A beautiful house in Marseillan, very tastefully decorated and well equipped. It is a very large and spacious house over 3 floors with 2 lovely sunny terraces on the top floor. A great position in the centre of the historic part of the town with 2 minute walk to shops yet quiet and peaceful at the same time. Arrival and departure were easy and well organised by the owners who were also helpful and flexible with dates and times. Will definitely return. Fantastic townhouse restored with the most beautiful attention to detail and respect for its origins. All three floors have a very special atmosphere and you are not sure whether you are in France. Everything works well and the house is very well equipped. Arrival in the house is also very well run and very friendly. Two fantastic terraces where the view over the city´s beautiful crooked roofs and sunset can be enjoyed, The house´s location is really good compared to Marseillan center and the port are both very charming and with many good restaurents and cafes. Short distance to the beautiful Mediterranean Sea and the magnificent beach. The small towns around inside the lake and weekly market in Marseillan and Sete highly recommended. The living areas of this lovely town house are really first rate. The kitchen especially is spacious, atmospheric and superbly equiped. The living room is equally spacious, full of character and very comfortable. The 2 roof terraces are also great. Luckily we only needed to use 2 of the 3 bedrooms as the third smelt so badly of damp as to be unusable. The second bedrom on the ground floor was the best, clean and bright with comfortable double bed and modern wardrobe. The master bedroom was full of character and also had a comfortable bed but there was a slight smell of damp especially in the built in wardrobes even in early September and the wallpaper was beginning to peel. The main bathroom and separate shower room while functional were badly in need of an upgrade of the bathroom suite and decoration. The location was great for both the centre of Marseillan which is lovely with plenty of resturants and cafes. It can get a bit noisy at times but this is only to be expected in a town house. In summary, if the bedrooms and bathrooms are upgraded to the superb standard of the living areas then this will be a truly remarkable property. We are well aware of the bathrooms needing an upgrade and this will be done next spring. Concerning the damp this is a problem in most houses in Marseillan during autumn/winter. Still we have this on Our TODO list aswell. When doing any work in the house it is essential for us to keep the character . This is what we like in a French house. Wir verbrachten 2 Wochen im August-- September im Haus in Marsaillan. Alles war bestens- die schöne Küche ausgestattet um ein 3 Gänge Menü für 6 Gäste zu kochen, das Wohnzimmer sehr geräumig, die Schlafzimmer auch groß genug. Die Bäder haben funktioniert, und wenn sie renoviert werden, umso besser! Gleich 100 mtr weiter ein sehr guter Bäcker und ein liebenswürdiger Austernverkäufer zu dessen Stammkunden wir bald zählten. Ein guter Standort um Ausflüge zu machen, oder einen Badetag zu planen. Schlüsselübergabe und Abreise verliefen völlig unproblematisch und freundlich. Wir würden gerne wiederkommen! As such, it's a marvellous place to relax and an excellent base for discovering the Languedoc 'Entre Mer et Montagne' (with a lot of grapes in-between). The 'Mediterané' only 5 minutes away by car. On this lovely beach going from Sète to Marseillan you can always find room. If you fancy walking the Cévennes just 1 hour ride by car. Here you have a lot of tourist attractions. Change-overs are on Saturday, to arrive after 4.00 p.m., and to leave by 10.00 a.m., to leave time for cleaning. Request booking by email. I will confirm and send a contract a.s.a.p. Linnen/towels can be rented. 18€ pr person We do the cleaning. This will cost you 60 € It is possible to rent linnen/towels at a price of 13€ pr pers.